It’s been quite a while since I’ve written anything on this blog. Life and other stuff has gotten in the way, but I thought it was time to start up again. I was looking for a new wine to try recently, and I decided to give Seven Falls Cellars a go. I chose their 2014 Rapids Red, which is an interesting red blend of 68% Syrah, 23% Merlot, and 9% Cinsault. The grapes used in this wine are sourced from the Wahluke Slope AVA in Washington State. This wine has a deep purple color with a dark ruby rim. It has aromas of ripe black cherry and blackberry, along with a hint of spice. On the palate it is full bodied and has a good balance of tannins and acids. It was aged in a combination of new and neutral oak for just the right touch and is not overwhelming. The alcohol at 14.5% contributes to the body of the wine and overall it is full flavored and well balanced. Seven Falls is a product of Ste. Michelle Wine Estates, and is produced in Paterson, WA. Ste. Michelle is the largest wine producer in the Pacific Northwest, and has a good reputation for producing quality wines. Along with the Rapids Red, Seven Falls also has several other varietal wines, including a Merlot, Cabernet Sauvignon, Chardonnay, and Viognier among others. The Wahluke Slope AVA is located in central Washington State, bordered by the Columbia River to the West and the Hanford Reach National Monument to the East. There are 20 vineyards within the AVA and nearly 8,500 planted acres of vines. The sandy soils, varied elevations and proximity to the Columbia River make it ideal for viticulture. It is primarily known for red grape varietals, such as Cabernet Sauvignon, Merlot, Syrah, and others. I would definitely recommend this wine, and I look forward to trying other wines by Seven Falls. Also, here is an interesting read about wine and robots. glass of wine. My most recent Pinotage adventure was another great wine this time from Stellenbosch. This was the 2012 The Owl Post by Neethlingshof. It was quite different in style than other versions of Pinotage I’ve tried, and I found it to be a very well made wine which carried many great attributes. It is a great example of how versatile the Pinotage grape can be, as it can be vinified into many different styles and can exhibit an array of different characteristics. 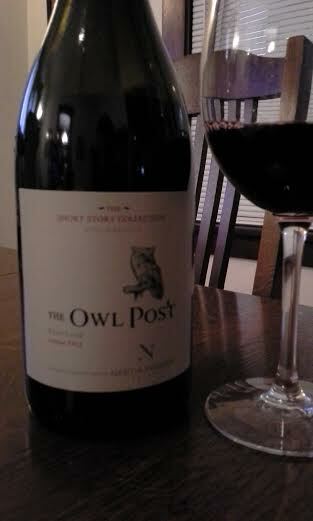 About the Wine: An estate wine, The Owl Post is a single vineyard Pinotage. The wine is full-bodied, apprearing dark garnet red in color along with cedar and spice on the nose with aromas of oak, coffee and ripe red berries. It has a nicely balanced structure, that comes along with flavors of coffee, chocolate, and spicy raspberry followed up with a silky smooth finish. This is a finesse wine, with just the right amount of oak and is big and full flavored. I was very impressed with how the wine presented itself and this is definitely a wine that has great aging potential. The wine was priced at $25, which I think is a fair price for a very well made wine. The Winery: Neethlingshof has a rich history in wine. Located in the Stellenbosch wine region, The farm was initially established in 1692, and originally called De Wolvendans, which means the Dance of Wolves. It was renamed Neethlingshof in 1828. The winery has a wide selection of wines, which includes the Short Story Collection, the Premium Red Collection, and Premium White Collection. The varietals range from reds such as Pinotage, Malbec and Merlot, along with whites such as Chardonnay, Chenin Blanc and Sauvignon Blanc, among many others. The Region: Stellenbosch is a very well known and important wine region. It is home to the majority of South African wineries, and wine growing here dates back to the late 1600’s. There are several different soil types and variations in elevation that contribute to the region’s terroir. The region has a very good reputation, and there are a lot of exciting wines being produced here. There is also a wide variety of grapes planted, which include (among others) Cabernet Sauvignon, Syrah, Merlot, Chardonnay, Chenin Blanc, and Sauvignon Blanc. I am looking forward to the next Pinotage I try, as well as more wines from Neethlingshof. was the first director of the Department of Viticulture & Enology at the University of Stellenbosh when he crossed the two varietals. His hope was that the grape would retain the great qualities of Pinot Noir and also have the heat tolerance of Cinsault. Most Pinotage wines are medium to full-bodied, and can be spicy and flavorful. The first wine made from Pinotage was made by the Welgevallen winery in 1941, and the grape gradually gained in popularity since then. The grape is grown is most growing regions in South Africa, the most being in Paarl, Stellenbosch, and Swartland. This 2011 by Nederburg is from the Paarl district. 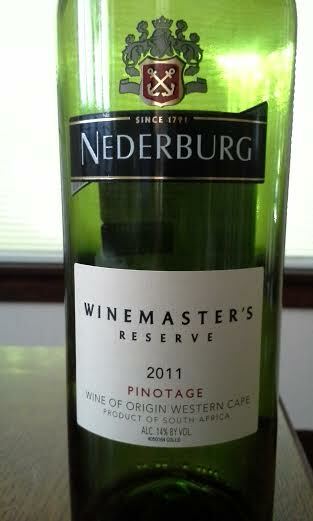 About the Wine: The 2011 Winemaster’s Reserve Pinotage is medium bodied, with spice and ripe cherry on the nose. It has a nice balanced structure, with smooth spicy raspberry on the palate along with some earth and minerality. The alcohol comes in at 14%, but it is very smooth on the finish. A very nicely made wine, it could pair with many occasions. For a price of $11, this is a very good buy. The Winery: Nederburg was founded in 1791 in the Paarl district of the Western Cape. Nederburg has a rich history in Cape winemaking and is a very large and important producer. With several labels ( Heritage Heroes, II Centuries, and Winemaster’s Reserve to name a few), Nederburg produces high quality wines ranging from Cabernet Sauvignon, Shiraz, Pinotage, Chenin Blanc, and Sauvignon Blanc among others. A highly regarded late harvest wine is produced as well. Along with great wines, Nederburg hosts an annual wine auction, a concert series, and also has a restaurant. The Region: Nederburg is located in the Paarl district, in the Western Cape. There is a variety of terrain, and most vineyards are planted on sandy, alluvial soils. Many vines are planted in the lower, warmer areas of the valleys, with some also being planted at cooler, higher elevations. The most planted varietals are Cabernet Sauvignon, Syrah, Chenin Blanc, Merlot, Pinotage and Sauvignon Blanc. I have been enjoying Pinotage wines recently and I found this one to be quite good, and would recommend it for sure. South Africa is a very exciting wine region that is a blend of new and old world wine styles. There are some very good wines being produced there right now, and It’s been my favorite wine region lately. One I tried just the other day is a Rhone style blend called The Wolftrap. Composed of Syrah, Mourvedre and Viognier, this wine is made by Boekenhoutskloof in Franschhoek, Western Cape. About the Wine: This wine is a blend of three Rhone Varietals; Syrah, Mourvedre, and Viognier. The 2012 vintage is composed of 67% Syrah, 31% Mourvedre, and 2% Viognier. It has a bright ruby-red color with aromas of toasty oak and spicy ripe cherries on the nose. It is nicely balanced and has a smooth finish of cherry and raspberry along with some earthiness. The 2013 vintage (pictured) is a blend of the same three varietals but just slightly different at 66% Syrah, 32% Mourvedre, and 2% Viognier. The 2013 vintage received a score of 88 points from Wine Spectator, and is priced at $11. The Winery: Boekenhoutskloof was established in 1776 in the Franschhoek Valley. In 1993 the estate was bought and the 22 hectares of vineyards were re-planted with varietals such as Syrah, Mourvedre, Viognier, Cabernet Sauvignon, and Semillon. Winemaker Mark Kent has helped Boekenhoutskloof see its reputation for producing quality wines grow significantly in the last 12 years. The Region: Farms were first established in the Franschhoek Valley in 1687. The valley is surrounded by high mountains with the Berg river running through it. Most vineyards are planted on the valley floor, but many are now being planted on steep slopes with well-drained sandstone soils. One of the oldest vineyards in South Africa is located in Franschhoek, being planted in 1903. Franschhoek was a wine ward within the Paarl district until 2010. It is now its own district, with the most planted varietals being Sauvignon Blanc, Cabernet Sauvignon, and Syrah. Other important varietals include Chardonnay, Merlot and Semillon. 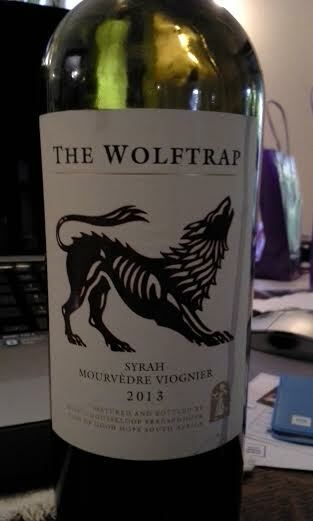 If you are looking for a smooth, easy drinking Rhone style blend, I would recommend The Wolftrap. I’m looking forward to trying more wines by Boekenhoutskloof, as well as wines from other producers in the Franschhoek Valley. The Ribera Del Duero region of Spain is well known for producing excellent reds. This DO is located in Northern Spain along the Duero River, and is home to many well known wineries, including one of Spain’s most famous, Vega Sicilia. The wines from this region typically are full-bodied and flavorful, and also deep in color. 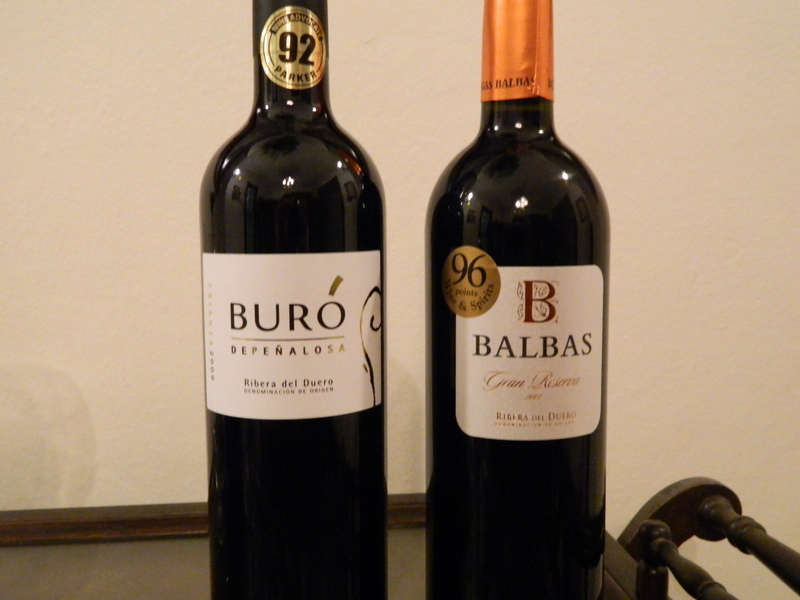 I recently tried two wines from Ribera Del Duero which I thought were quite exceptional. The first I tried was a Crianza from Bodegas Pascual. This 100% Tempranillo from their Buro Selection had a deep dark ruby red color to it with hints of tar and spicy black cherry. It was a full bodied wine with excellent structure and had a nice smooth, spicy finish. The Wine Advocate gave this wine a score of 92, and at a retail price of $26, this was a great deal for a very well made wine. Tempranillo and 10% Cabernet Sauvignon. I first decanted this wine for a little while, which allowed for the wine to open up and present itself. It had a deep dark red color with a bit of sediment in the glass, and it had a nose of ripe cherry and toasty oak. An elegant structure of tannins and acids led to more cherry flavors and hints of chocolate and spice. It had a nice smooth finish, and was a very well-balanced wine. It paired very nicely with grilled rib eye steak, and easily could be paired with a variety of meal options. Wine and Spirits gave this wine a score of 96, which I completely agree with. At a retail price of $85, it is worth every penny. I look forward to trying more wines from both Bodegas Pascal and Bodegas Balbas, and would definitely recommend both of these wines. Arneis is a white wine grape that is grown in the Piedmont region of Northwestern Italy, most notably in Lange DOC and Roero DOC. It is primarily grown in the Roero DOC, which is the region that it originated from. It tends to be difficult to grow, and Arneis literally means “little rascal”, due to the grape’s erratic ripening . Despite the difficulty in growing the grape, Arneis can produce very good wines with excellent aromatics and flavors. 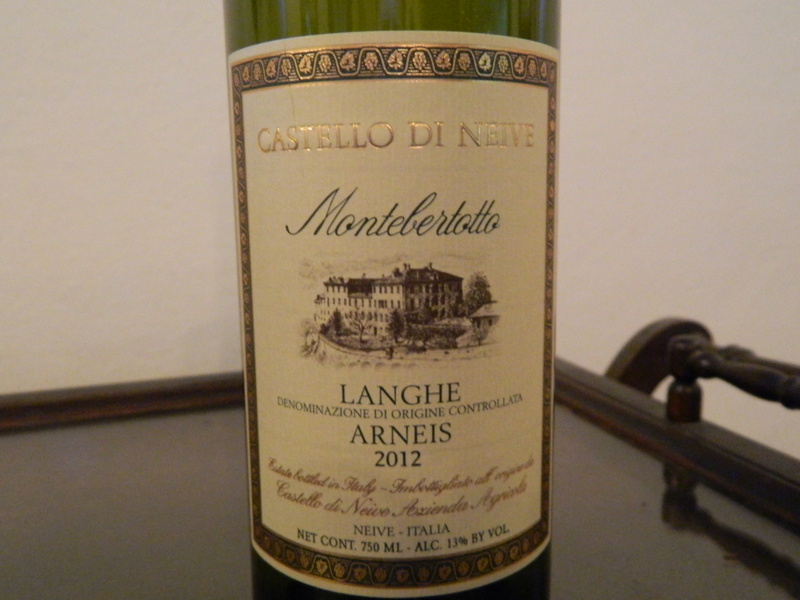 The Arneis I tried was a 2012 produced by Castello Di Neive, which is a family run estate winery consisting of 150 acres located in the town of Neive, which is within the Lange DOC. From the Montebertotto vineyard, the vines were planted in 1977 and sit in a calcareous marl soil. The wine was fermented and aged in stainless steel tanks for 3 months, then bottle aged for another 3 months. This wine had a straw color, with a crisp nose of fresh apples and pears. It had good acidity on the palate along with a hint of honey, and a nice clean finish with a touch of almond. I found it to be a very refreshing and enjoyable wine. I could see this being paired with a variety of dishes, and even enjoyed on its own. This was definitely a wine worth purchasing, and if you are not familiar with Arneis, I would recommend giving it a try it for sure. The other day I was in the mood for some Chilean Carmenere, and at my favorite local wine shop I came across a bottle of Carmenere from the Puemo area of the Cachapoal Valley. This growing region is located within the Rapel sub-region of the Central Valley, and is known for red grapes, mainly Cabernet Sauvignon, Merlot, Syrah, and Carmenere. 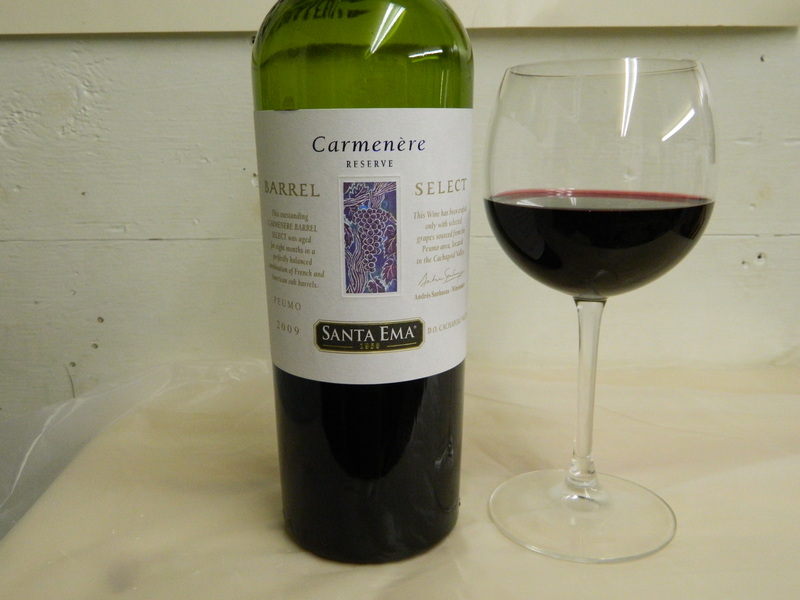 The Carmenere I tried was a 2009 from Santa Ema. I really thought this was a great bottle of wine. It had that distinct earthiness that is typical of many Chilean wines, and a nice finish of spicy raspberry. For $12 this was a steal of a deal. Another Chilean wine I thought was quite nice was a 2008 Cabernet Sauvignon Reserva from Santa Rita. This Cabernet was sourced from the Maipo Valley, which is the oldest growing region in Chile. A sub-region of the Central Valley, the most widely planted red grape here is Cabernet Sauvignon. The Maipo Valley benefits from ocean breezes and higher elevations, which provides cool growing conditions in many areas of the region. This wine also had a nice earthiness to it, with hints of spice and black cherry. It was a well balanced full-bodied wine, and also was a great deal at $15. There is a lot of good wine coming out of Chile these days, and if you are a fan of Chilean wines, I definitely would recommend both of these. Another Lake County, California wine producer I’ve tried out is Langtry Estate & Vineyards. This estate winery has a large estate (over 23,000 acres) that spans from Lake County to the Napa Valley. The winery at Langtry has been producing wine since 1981, and has a wide selection of wines. Langtry has two different labels that they produce; Langtry and Guenoc. Most of the Guenoc wines are made with estate grown Guenoc Valley grapes. 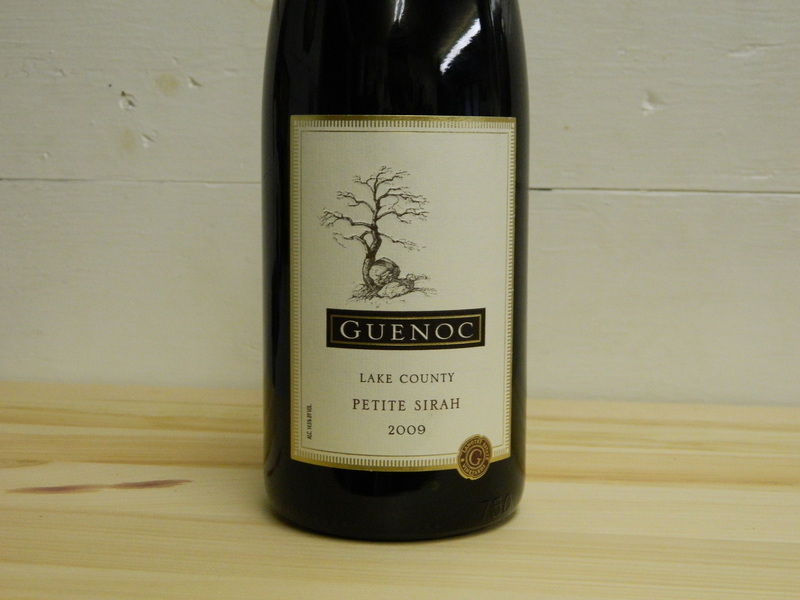 Recently, I tried their 2009 Guenoc Petit Sirah. This was a full-bodied wine with a deep purple color. With aromas of toasty oak and ripe black fruit, it had a nice smooth finish with a hint of spicy blackberry. Overall I thought this was a nice wine and for $15 it was definitely a great deal. 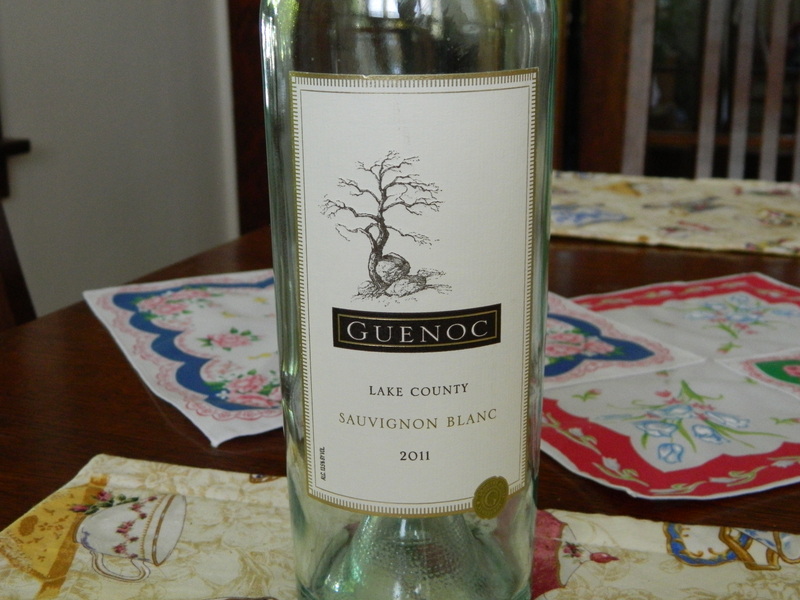 I also tried the Guenoc 2011 Sauvignon Blanc. At $12, this was nicely balanced and had a nose of citrus and tropical fruit, and a finish that reminded me of fresh grapefruit. It was quite a refreshing glass of wine, and paired nicely with seared sea scallops. Both of these wines are very good and definitely worth checking out. I’ve been impressed with wines from Lake County, CA thus far, and I’m looking forward to trying more. Recently Petite Sirah has been one of my favorite wines. Wines made from Petit Sirah typically are full bodied and peppery with deep color. One of the latest I’ve tried is Writer’s Block. This wine is produced by Steele Wines based in Kelseyville, CA. The winery is located in Lake County CA, which is in Northern California and is north of Napa Valley. Lake County is part of the North Coast AVA, but within Lake County are three smaller AVA’s; Clear Lake, Guenoc Valley, and Benmore Valley. A large portion of Lake County is taken up by Clear Lake, the largest natural lake in California. The most planted grape varietals in Lake County are Cabernet Sauvignon, Chardonnay, Sauvignon Blanc and Zinfandel. But also others such as Petite Sirah are also planted. Steele wines has five different labels that includes a nice lineup of wines, ranging from well known varietals like Cabernet Sauvignon, Chardonnay and Merlot, to varietals like Aligote, Counoise, and Roussane. 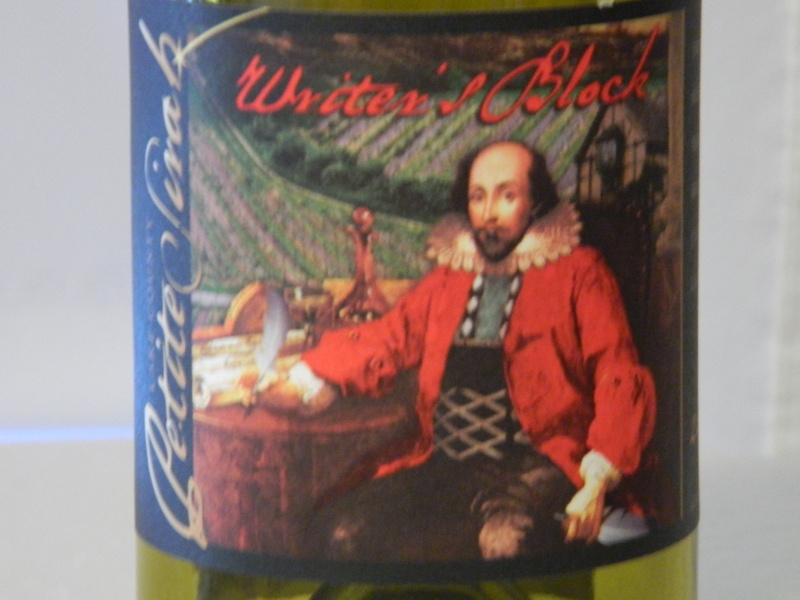 The Writer’s Block Petite Sirah I tried was a 2009, and I found it to be quite good. 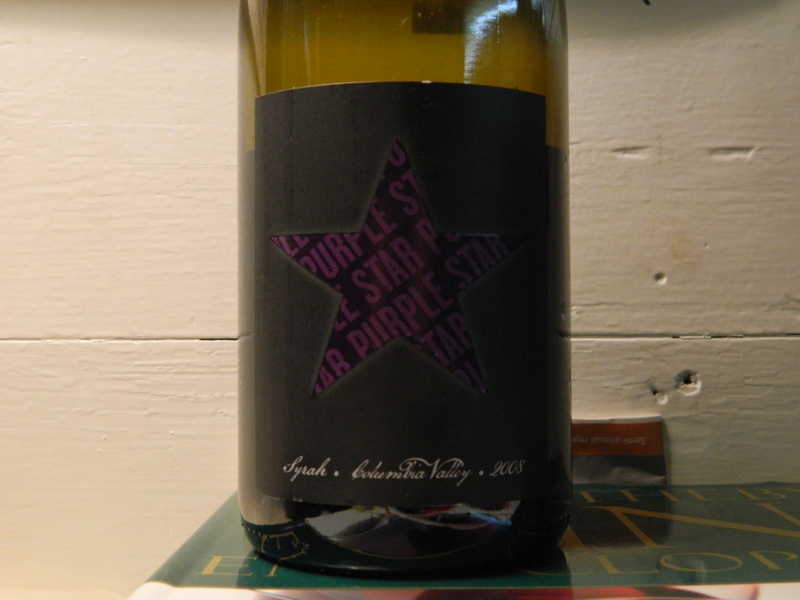 Presenting itself in a deep purple color, it had a nose of spicy ripe black fruit along with a hint of toasty oak. The wine was full-bodied with a good balance of acid and tannins, which was followed by a short but smooth finish with hints of spicy plum and raspberry. I really enjoyed this wine, and has been one of the better Petite Sirahs I’ve recently tried. I can see this being paired with a variety of foods, including grilled meats or a spicy pasta dish. So if you are looking for a big full-bodied red, I would say Writer’s Block Petite Sirah may just be what you’re looking for. I’m always in the mood for a glass of Syrah, and lately I’ve had the opportunity to try some good ones. A while back at a family get-together we compared 3 different Syrahs: one each from Australia, Washington State, and France. It was a chance to compare wines from three completely different terriors, as well as comparing the old world versus the new world style of winemaking. First up was a Shiraz from the Borossa Valley of Australia, a 2008 Two Hands Bella’s Garden Shiraz ($70, 14.8% ABV). This one I have reviewed before, and it is very well made wine. Full bodied with a nice flavor of blackberries and spice, it was a nice one to start with. The second wine was A 2007 Sequal Syrah from the Long Shadows series of wineries ($30, 14.7%), out of the Columbia Valley of Washington State. This was a full bodied wine as well, with a nice deep purple color. Along with a good structure, it had aomas of blackberry and spicey oak. It seemed to take a little while to open up, but it was a very good glass of wine. The final wine was a 2010 Yann Chave Crozes Hermitage ($21, 13.5%), from the Rhone Valley of France. A Peter Weygandt selection ,this wine had a deep ruby red color to it with aromas of cherry and spice, and along with that the first sip yielded a nice earthiness, along with a smooth finish. This wine also took a little while to open up, but when it did it certainly was good. This wine certainly seemed to be the most food friendly, and paired quite nicely with the rib steaks we were having. All three wines were well made, and it was hard to pick which one I liked best. The Australian and Washington State wines both were both of the new world winemaking style, full bodied with juicy fruit and spicy oak. The Crozes Hermitage comparatively was the old world; medium bodied with a earthy tones and and a smooth finish, and a little more food friendly. I would have to recommend them all, it just depends if you favor the old world or new world style of wine making. Slope AVA and the Yakima Valley AVA. This wine had a smooth finish and aromas of blackberries and spicy vanilla. 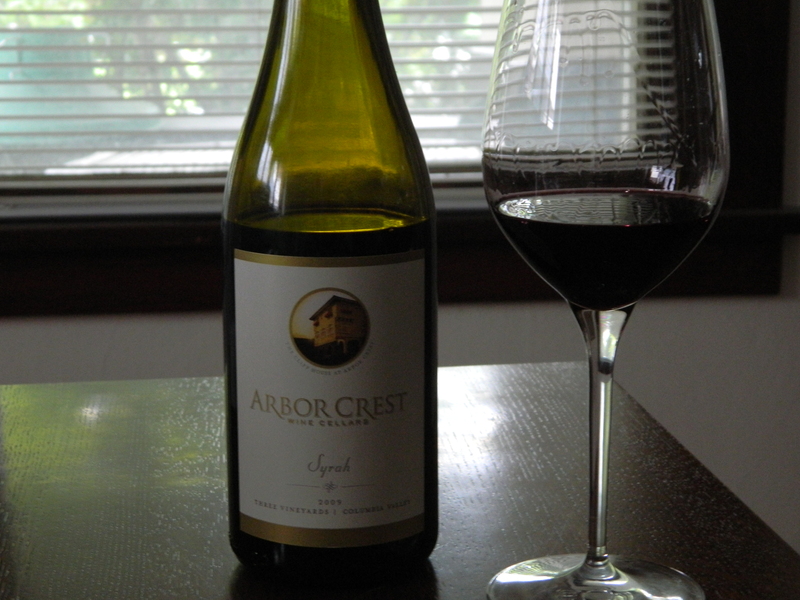 Arbor Crest makes an excellent Syrah as well, with the 2009 vintage ($24, 13.8%) being quite exceptional. This wine is made from Columbia Valley grapes sourced from 3 vineyards. It is full bodied with aromas of spicy blackberry and oak, and has a nice spicy finish as well. The 2010 vintage is also an excellent choice.